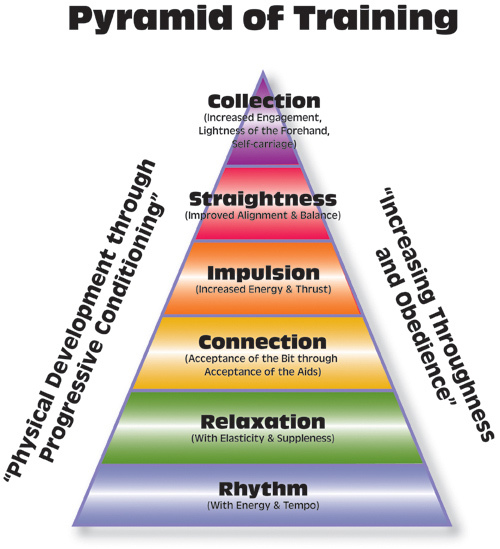 I’ve been thinking a lot about the training pyramid lately. You know, that infamous dressage textbook illustration. I know we’ve all seen it a million times, but I’m putting it up anyway. My riding and training has been so hopelessly sporadic this summer. Not everything has been terribly productive, and I haven’t put nearly the miles on that I wanted to. I was busy at work, the house demanded attention, Tristan went through health issues (again, some more, blog post to follow, resolved now), and then we went away on vacation. A lot of my life is in a tumult right now. I’ve been doing a lot of long, hard, deep thinking, trying to mine my own brain to sort out my reactions to things, the ways in which I can control my own reactions and behaviors, and the decisions that I’m making. My watchword right now is deliberate: I have to be ok with the choices that I make and why. No letting things happen. On Sunday, I had a ride that worked out beautifully. It was a combination of a lot of things that led to success, but if I had to put my finger on it, the thing that worked out best for me was after walking around the fields to warm up, we trotted around the outdoor dressage ring. Two times, each way, and all I asked for was rhythm and focus from him. No squirreling around, no sucking back, no slamming in and out of the contact, no fights. I simply held the reins in such a way that I could feel the bit, and asked him to trot forward consistently. It was nothing fancy or extensive – it took us maybe 12 minutes. On lap 3, he started to soften through the corners instead of motorcycling. On lap 4, he started to fill out both reins evenly, and then by the end of the lap, he had stretched into the outside rein and begun to soften. I called it quits. I dropped the reins, patted him, and we moved on to something else – walking the roads for a bit, then up the hills to get some quality muscle work time. I’ve been reflecting on that ride since, in the same way I am turning everything over endlessly in other parts of my life. I think I’ve finally untangled something in my brain. See, Tristan is a more or less trained horse. Buried inside his brain and in his body are all the tools and memories necessary to put together a very good Training test that on a good day is schooling first. But that’s not where or what he is right now. I can’t swing a leg over and expect that horse. And I guess I have been: I’ve been putting him through a cursory warmup and then trying to school shoulder-in, or haunches in or canter transitions. These are all things he has schooled well in the past, and yeah, we’ve been sort of getting to them. Not well – not happily – not cooperatively – but the work has been produced. Sometimes it’s the right call to muscle through and get to the horse you know is inside. Not right now. Tristan needs to go back to the base of the pyramid, and that needs to be our only focus. Just because he has all the pieces of the pyramid doesn’t mean I can just slap them together and zip up to the top. So, tonight: rhythm. Short, sweet, 30 minutes focusing on a forward, elastic gait in the walk and trot and maybe in the canter. If we get it, our reward will be a taste of relaxation at the end. Then we repeat. It’s a self-discipline thing. Just because I feel something in him does not mean I have to reach for it and drag it out. Just because I know what a balanced connected trot and canter feel like does not mean we have to get it tonight. Or the next night. It’s both humbling and frustrating to have to do this again, once more, for the millionth time. Tristan is 21, and he has been under saddle for 11 years now. I have been riding horses for 2/3 of my life. Back to the beginning we go. horses. that's always the way, isn't it? it seems like the more i learn and the more i 'progress,' the more time we spend on really digging into those most fundamental concepts in the horse's way of going.